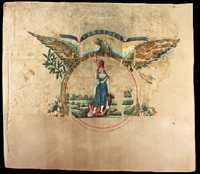 This flag was carried by an unknown Virginia regiment. On April 8, 1865, Major Thomas Ward of General Armstrong Custers's cavalry division captured it near Namozine Church. Major Ward was General Custer's brother-in-law.